That’s well said. People in Buffalo, in general, don’t watch a lot of college football. 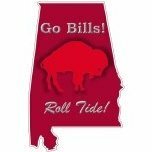 There are 5 or 6 guys on Alabama (minimum) that would start on the Bills now. Tua is as good of a QB prospect as I can remember. So many here assume “the Bills would trash them” but guys on this Alabama team will be starting all over the NFL in the next 3 years. They aren’t going to be magically better a year from now. Tre White went from a really good SEC CB to a really good NFL CB in a year. He didn’t get way better in 8 months. He was largely the same player just now in an NFL uniform instead of an LSU uniform. The gap between the top college talent and bottom NFL talent is WAY smaller than its ever been. The NFL middle class is no longer around. You have top guys and guys on rookie contracts. Don’t underestimate that. You are missing the irony here. The guy that the Bills had on their opening day roster was a backup at Alabama. You are WAY underestimating the talent level. There are, without question, more 1st round picks on that Alabam roster than on the Bills. I’d encourage anyone that hasn’t watched Alabama to watch them before commenting. They shouldn’t be looked at as “a nice college team.” They may be the greatest college team ever (and that’s not hyperbole). They are right there with 1995 Nebraska and 2001 Miami imo. The way the Bills played week 1 and the first half of week 2 when they were not an NFL standard team by a long chalk I'd have taken Alabama if I am getting 28.5 points. You watch a lot of football. Would you agree that there are (potentially) 5 guys on Alabama’s offense that could start on the Bills now? The two guys in the middle of Alabama’s defense will be top 10 picks. They aren’t getting mauled by the bottom of the barrel NFL players. Do you think that Bodine and Vlad would maul Harrison Phillips? He was a much lesser prospect a year ago. I think Tua still has some way to go though clearly very talented... him v Josh Allen might right now be a wash. He would clearly start over our other QBs. The other 4 would be instant starters - yes. If Daboll doesn't screw it up, we have a 50% chance of taking it to the house with Chris Ivory. Every. Single. Carry. //Daboll calls 50 pass attempts for 100 yards and 3 pick 6s in a hard fought 24-21 win. Why do you think that Alabama would be so bad against the run? Especially as the NFLs 4th best run defense is anchored in the middle by a rookie and a 2nd year player who two years ago started together on the defensive line of the Alabama Crimson Tide. Those two would have held their own in the NFL two years as well. Why? Cos they are really darn good. 'Bama has crazy high talent. It isn't like other college programmes. They are churning out 1st and 2nd rounders, year after year after year. I think most will agree, Bills win handily. BUT, the question is what is a fair spread, and that 28.5 makes me wonder which way I’d go. I think the grown men would take umbrage against the kiddy challenge and run it up if they could. I’d go Bills, but not with much confidence. Those two against Bodine, Miller and Ducasse is not a fair fight. Would be a metaphorical blood bath. I think most will agree, Bills win handily. BUT, the question is what is a fair spread, and that 28.5 makes me wonder which way I’d to. I think the grown men would take umbrage against the kiddy challenge and run it up if they could. I’d go Bills, but not with much confidence. I think that the cool thing about it is that it is from a real Vegas oddsmaker. Vegas didn’t build those big buildings by losing. That spread isn’t ridiculous one way or the other. I happen to think that the game is closer to 20 than 30 but this game wouldn’t be 56-0. Whats the bust rate of first round DL picks in the NFL? Whats the bust rate of second round DL picks in the NFL? I will give you a hint substantially higher than 50%. Being an NFL drafted pick, even a high draft pick, does NOT in any way shape or form translate into succeeding in the NFL. So I don't care how many projected picks they have, odds are through the roof that all 3 of them wont translate into good NFL players. In fact, its a higher probability they all bust than even 1 becoming a good NFL player. So your projected "draft picks" are going up against guys ALL succeeded in becoming NFL starters. This is the biggest source of fan myth about predicting college teams to beat NFL teams. They talk about ALL the guys projected to be "DRAFTED" as if they will all be good NFL players. The reality is, out of all the players on the Alabama team, only a small portion will even get a chance to play at the NFL level, and even fewer are going to be starters, and even fewer than that will have sustained success...and even fewer will go on to be great players, IF ANY. So sorry, this argument has no merit. A few guys who MIGHT have NFL careers with a bunch of guys who will never play a down of professional football again are going up against 22 guys who all beat the odds and earned their way into a starting job, even if they aren't among the better starters in the league, they still have accomplished more than the vast majority of all college players will ever accomplish. The vast majority of the Alabama roster couldn't even make it to our practice squad, let alone start in the NFL. You are missing the irony here. The guy that the Bills had on their opening day roster was a backup at Alabama. You are WAY underestimating the talent level. There are, without question, more 1st round picks on that Alabama roster than on the Bills. An NFL team will beat any college roster even if it were entirely comprised on 1st and 2nd round prospects, IMO. The operative word here is prospect. Half of those first rounders will eventually (maybe 2-3 years down the road) be mediocre NFL players and about two-thirds of the second rounders will, so "draft buzz" is just that for a large swath of the Alabama roster--buzz. Add Waddle.....Najee AND Damien Harris aww hell they all could compete! Nonsense. Bama has two guys in the interior of their d-line who will be top ten picks this year. The bust rate for guys like that is not high at all. And of course, the Bills' roster isn't exactly peppered with NFL stars, especially on offense, where plenty of our starters would struggle to make the 53-man roster on other teams. Someone else here posted a link showing that there are 54 Alabama players on NFL rosters right now, the vast majority of whom have been in the league four years or less. That gives you some idea of the talent coming out of there, year after year. Pretty much every starter on the current Alabama team will get a shot to play in the NFL, and so will some of the backups (like Robert Foster last year), so your statement that "only a small portion will even get a chance to play at the NFL level" is simply not true. Go look at the list of Alabama alumni in the league, and keep in mind that the current team is probably the most talented Alabama team ever. Who are they going to use to block our front 7. A few have noted here that the majority of the current NFL players from Alabama are relatively young (<4 years in the NFL) and point to that as a sign that the Alabama roster is getting stronger. That’s a really poor analysis. The average tenure of an NFL player is less than 4 years (3.3 years). So, it would be very odd if the majority of Alabama alumni are not short tenured in the NFL. A good point was made about high draft picks. After a couple of years, most draft picks, particularly in rounds 3 or later are no longer on the team that drafted them. By year 4, only about 3/4 of first rounders are still even on the teams. That tells us that 1st rounders aren’t very sure fire. If we look at the 5th year, where teams have to exercise their options, only about 2/3rds of round one picks even get their contracts picked up. So, being a high draft pick (round 1 or 2) is no guarantee of NFL success (i.e. quality). The Bills have players that have shown a tendency to stick in the league, even if they are poor for their positions. 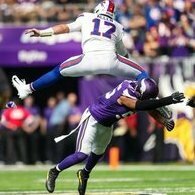 What we can probably say is that for every player on the Bills, they are highly likely to be among the best 64 players in their position in the league. You certainly can’t say that about the majority of Alabama’s roster as history shows, they don’t last in the league that long. Because their entire front 7 will get pancaked by grown men, corners pancaked by grown men, and Ivory will truck through whatever remaining 3 teenagers and 20 year olds are still standing IF they can even catch him. They're playing the best players on a roster spanning 10 year careers good enough to make it to a 32 team league and 80% of them are DESPARATE to even get drafted into that league.. if they 4 year players they haven't been drafted if they 18 they ain't grown. It's pure athleticism, might as well lose the Quarterback and throw in Edmunds and Jerry Hughes to wipe up any player who is AT BEST as fast and strong as Edmunds is. Sam Darnold. Jackson, Rosen, and Mayfeild where top college QBs last year. How are things goin for them. They couldnt score on our D if their lives depended on it. They didnt just hold a big 10 ten tesm to 190 yards and that was the Minnisota Vikings they beat 27-6. That was Tom Brady they where holding to feild goals.